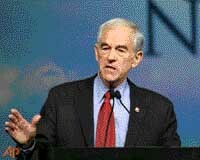 The difference between Rightwingers and conservatives, and why I respect Ron Paul. Politically I'm a progressive also known as a liberal, I'm left of the political spectrum and I don't see that changing any time soon. But after reading some news coming out of the Conservative Political Action Conference or CPAC lead to me think more about the differences between who I call 'Rightwingers' and true 'conservatives' and the war of words that has been flying at their annual get together. There are two sides to all this, the Rightwingers and the libertarians. For the most part these two groups are conservative but upon closer inspection there are some major differences. The Rightwingers are strongly pro-christian, business, anti-islam, family values and favor establishment GOP politicians. Libertarians on the other hand are more open on these issues for example the inclusion of the openly gay conservative group 'GOProud' is more than enough to get Rightwingers pants in a twist. And there would seem to be more real conservatives out there than these crazy Rightwingers. Congressman Ron Paul was not in attendance this year but a straw poll held at CPAC on who would you vote for in the GOP primary Ron Paul came out on top at 30% with Mit Romeny at 2nd place with 23% and the darling of the Rightwingers, Sarah Palin could only muster a pathetic 3% way behind in 9th place. Now I have to admit I like Ron Paul even though I disagree with him on many issues, I can at least respect him for standing up for his conservative beliefs and views. He is not a 'bought man' to say he is not owned by lobbyists, his views, opinions and beliefs are his own not some corporation or lobbyist.